Meanwhile, make sauce: In a small bowl, whisk together mayonnaise, remaining 1/2 teaspoon tarragon, and lemon juice; season with salt and pepper. Set aside. Line a rimmed baking sheet with aluminum foil and brush with oil. In a food processor, place bread, a pinch each salt and pepper, and remaining tablespoon oil; pulse until fine crumbs form. Lay fillets flat on prepared baking sheet; season with salt and pepper. Spread top sides with mustard; sprinkle with bread crumbs, pressing to adhere. Bake on upper rack until fish is cooked through and crumbs are browned, 6 to 8 minutes. 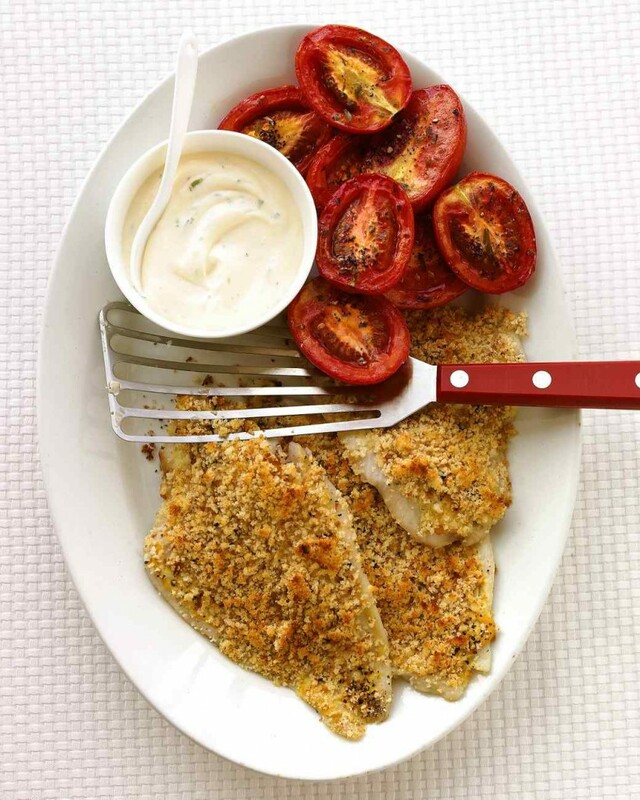 Serve with tomatoes and sauce.